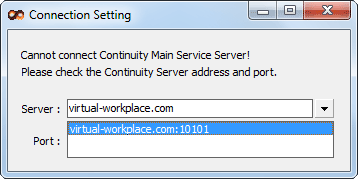 Install the Continuity client in a directory of your choice. Launch the client which will pop-up the server 'Connection Setting' dialogue (see image) - this dialogue can also be found in the Lobby menu - see Tools/Options/Connect. Select the pre-defined 'virtual-workplace.com' server. Once your press 'OK' you are ready to connect to our demo server. For logon accounts see the 'Example Company' below. The demo server features an 'Example Company' with several staff-accounts. Each staff has a different position that defines their access to the company's data stored in Continuity. Please Note: Every full hour, the demo server will be stopped, reset and all content refreshed.